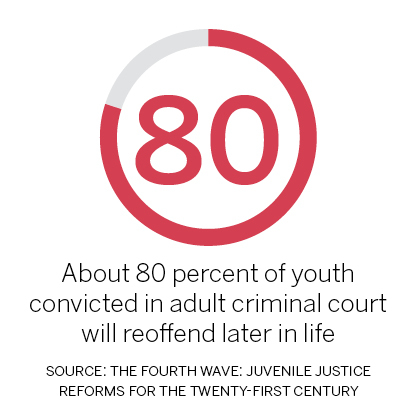 Facing charges as an adult — beyond the risk of prison time — heightens at-risk children’s chances of ending up back in that same courtroom later in life. The correlation was finally legally realized when Gov. Andrew Cuomo signed the “Raise the Age” bill into law Monday. Cuomo’s signature means New York no longer stands with North Carolina as a state that prosecutes 16- and 17-year-old children as adults in court. The legislation came after the state senate passed its $153.1 billion budget, which included funding allocated toward raising the age of adult charges from 16 to 18. The senate’s approval of the budget was vital because it recognized the dangerous, self-defeating cycle that prosecutes minors in adult courts. 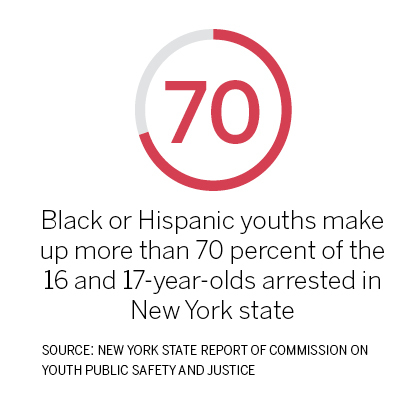 In 2016, 24,625 teenagers aged 16 and 17 were arrested in New York state, and 70 percent of those arrests were on misdemeanor charges, according to data from the state’s Division of Criminal Justice Services. These children, despite their age, ran the risk of being prosecuted as adults. Reforms like the “Raise the Age” law, while necessary and overdue, highlight the current failings of the United States’ criminal justice system. Nationally, more than 76 percent of all inmates released from state prisons find themselves back there within five years, according to the National Institute of Justice. This cycle of crime, conviction, prison and repeat has created a social class of individuals whose lives center around the courtroom. Prison, which is designed to be a punishment that deters individuals from committing crimes again, appears to do more harm than good. Starting this sequence at 16 or younger only exacerbates the problem for thousands of teenagers every year — especially those who are black or Hispanic. These youths make up more than 70 percent of the 16- and 17-year-olds arrested in the state, despite comprising only 33 percent of 16 and 17-year-olds statewide, according to the state’s Report of Commission on Youth Public Safety and Justice. “Raising the age of criminal responsibility is one of the most important ways to improve the lives of youth who come in contact with the justice system,” said Naomi Post, executive director of the Children’s Defense Fund-New York, prior to Cuomo signing the bill into law. In prior years, Post said, the senate was resistant to entertaining the prospect of raising the age, which presented an “insurmountable obstacle” to the proposed legislation’s passage. This year, she added, the political landscape was “prime” for ensuring the passage of the “Raise the Age” bill. Criminal justice reform has always been a challenging subject to address at both the state and federal levels. Appearing “tough” on crime has always been safer for politicians who are susceptible to the whims of voters, and weakening sentencing rarely helps to garner favor from one’s constituents. “Raise the Age” was — and still is — a controversial proposal for this same reason. But this debate is not warranted. There are absolutely some violent crimes that merit full adult prosecution, and a child should not get off on murder charges simply because they haven’t turned 18 yet. But when someone who is not considered old enough to vote, drive without restriction or drink alcohol can be tried in an adult court for a non-violent crime, it’s evident that something is fundamentally wrong with the system. The passage of the “Raise the Age” bill is one checkmark off a long list of injustices that must be addressed by the state and federal governments. But while other, perhaps more significant flaws in the criminal justice system must be addressed, it’s important that small but meaningful changes like no longer prosecuting children as adults get the attention and consideration they deserve. Cole Jermyn is a junior environmental resource engineering major at SUNY-ESF. His column appears weekly. He can be reached at cdjermyn@syr.edu and followed on Twitter @Cjermyn8.